Jane and Allison are best friends and would do anything for each other. When the new girl Lanalee comes between them, Jane knows something is up. There is something that just seems evil about this girl. But when Lanalee turns out actually to be evil incarnate, things take a turn for the weird and the stakes for Jane are raised significantly. 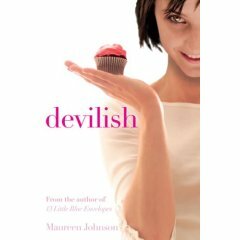 While it may seem a bit Buffy the Vampire Slayer, this is actually a clever original re-telling of the selling-your-soul-to-the-devil story. It's both entertaining and well-written (although it is very poorly edited -- I counted no fewer than three significant typos! -- who's proofing the galleys?!). There's ample opportunity for dry humor (my favorite being the comparison of corporate culture with hell!). Johnson has a great way with characterization and creates a truly multi-faceted Jane who can grow a little but still be very much a teenager. Fun! Wow! Two really good books in a row...either I got lucky or I've become a softee! I've seen this on shelves and was pretty interested. I have yet to read it, but it looks good.